personable and make it point to f or visit winhilladvisors.com or tricities.homesellingnow.com mag@topagentmagazine.com | www.topagentmagazine.com For more information about Brandi Kirkeby www. No portion of this issue maycall be reproduced in any manneror whatsoever prior consent of the people publisher.we Top Agent please 361 - 658 - 3823 emailwithout brandik@kw.com work with. 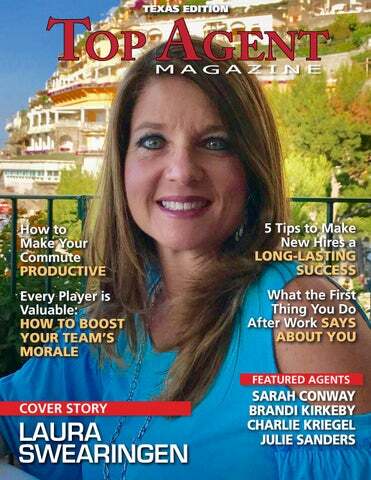 To us, t Top Agent Mag Magazine is published by Feature Publications GA, Inc. Although precautions are taken to ensure theclients accuracy ofCopyright published have confidence in us an materials, Top Agent Magazine cannot be held responsible for opinions expressed or facts supplied by its authors. notMagazine ours, and it’s not about u Copyright TopIt’s Agent To subscribe or change address, send inquiry to mag@topagentmagazine.com. 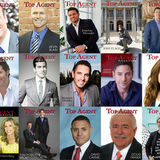 real estate advocates, but also as https://www.facebook.com/PendletonAreaHomes/ Published in the U.S.
visit SarahConwayProperties.com, email SConway@SarahConwayProperties.c Toppage Agent Magazine call (936) 494 – 9999, or visit herhttps://www.facebook.com/pg/SarahConwayProperties/post Facebook here. www. a good match for the long haul requires more than just assessments of skill and personality. To ensure a talented new hire sticks around and is truly positioned for success, the onboarding process must be executed with the same care applied during hiring. For a few ideas on how to make the most of the onboarding process, consider the tenets below as you guide your new hire toward long-lasting success within your company. Let’s say you’re looking to add a new buyers agent or loan processor to your team. You write up the position’s responsibilities, but neglect to mention that you want the new hire to handle a host of administrative tasks, as well. Maybe it doesn’t seem important enough to outline in detail, as it’s the sort of thing the rest of your does. Miscommunications like these are a leading reason why new hires leave their roles. If there isn’t clarity and transparency about a position’s true responsibilities, then new hires may become quickly disillusioned and seek out greener pastures. While stocking the breakroom with bagels every Friday may seem like a small gesture, it’s often those little morale-boosting moves that build loyalty and comradery among the team. Bike-to-work incentives, subsidized gym memberships, and benefits that match the needs of your employees—all are ways to demonstrate appreciation and investment in your team. Likewise, the right candidate will return the favor and invest his or her energies into their new role. Another reason new hires move on may have nothing to do with you or your office. In fact, many hires in entry-level or even intermediate roles have doubts about their long-term vision. That’s why it’s important to be upfront from the beginning regarding a candidate’s five-year plan and ultimate dream job. Maintain realistic expectations when asking these questions, but use it as an opportunity to gage a candidate’s seriousness about the real estate or mortgage industry. Why this line of work over another? Emphasizing industry longevity and career growth during the interview process can save you drama down the road. Take a proactive approach in communicating with your new hire. Take time to check in regularly during the first six months of his or her addition. If you can, make time to train new hires yourself—if only for a part of the onboarding process. You’ll forge a deeper professional bond and create an avenue for further questions. All in all, make it clear that you’re personally invested in their presence and talents, and that you care what they have to say. That way, if any issues or doubts arise, you can stay on top of it and work out a solution, rather than lose a new employee. To learn more about Laura Swearingen visit LauraSwearingen.com, html email laura@swearingenteam.com, call 817 – 233 – 1766, https://www.facebook.com/LauraSwearingenTeam/ or visit her Facebook page here. www. sional who internalizes work-related stress. Of course, you’ve chosen a healthy release for all that pent-up tension, and you’ve discovered the power of endorphins. Once work hours are over, not everyone finds the motivation to stay active. This means you’re driven by routine, conscious of your emotional and physical health, and prefer to leave your cares at the gym, rather than bring them into your home oasis. However, it’s important to give your body a rest now and again, as recuperation time is not only beneficial for physical health, but can help prevent burnout for the long haul. Flexibility is a skill, and one just as important to cultivate as rigid commitment. If you find yourself out of sorts if you miss just one day of working out, you might want to pay some attention to your routines and motivations, and rebalance your commitments and fitness routine accordingly. appropriate, healthy balance between your time at work and your time at home with the loved ones and hobbies you cherish. If making way for downtime isn’t easy, try penciling it in the way you would a work engagement. Dinner with a friend, a date night with a significant other, or a solo movie fest can be readily added to your calendar, and thus built in to your regimented schedule. Turn to Food If your first instinct after work is to eat, it can say a few different things about your routine. Perhaps you’ve been so on-the-go all the day that you haven’t had time for lunch. In this case, you might need to regiment your schedule with more purpose aimed towards downtime and self-care; food is fuel, after all. If you head home and gorge after an average day, you may be turning to food as a way to relieve stress. In this case, you may need to reassess some of your post-work habits and find a healthier balance and outlet for your tension. Taking a walk, grabbing fresh ingredients for dinner, hitting the gym, or decompressing by catching up with a friend or a good book—all are healthier, more balanced ways of executing the transition from the office to the home. Pay attention to your consumption post-work. Determine how hungry or satiated you really are before making a grab for the nearest sustenance. People decompress in all different ways after getting home from the office, but always remember that routines are telling. Don’t take your daily actions and impulses for granted. Examine the root behind your well-worn practices, and you may detect nuances at play beneath the surface that can you help you recalibrate for the better. SARAH CONWAY After graduating from Texas A&M University with a degree in Biomedical Science, Sarah Conway set out for a professional path that would blend her service-oriented attitude with her knack for detail work. When she earned her license in 2003, she expected to dive into life as an agent. Instead, she became happily immersed in the world of appraisals. “I was really drawn to the thought processes and analytics of the industry,” Sarah remembers. She earned her appraisal certification for residential properties and spent the next few years mastering the ins and outs of property evaluations. In 2009, she began taking on sales work in residential properties, ultimately earning her broker’s license seven years ago. It was then that her work in sales began to build momentum and she made the transition as a full-time agent. In the time since, Sarah has cemented her reputation as a consummate professional swiftly on the rise, in command of a valuable skillset that ensures her clients’ successes for the long haul. To give back, Sarah takes an avid role in her local community through various charitable efforts. She serves as Treasurer for Bentwater Volunteer Families (BVF), an organization that facilitates family volunteer projects with existing non-profits, such as Meals on Wheels. Likewise, she is a volunteer with the Special Olympics, served on the board for the Bentwater Property Owners Association, and volunteers with the Montgomery Independent School District. In her remaining free hours, Sarah most enjoys time spent with her husband and children, traveling, and unwinding with a good book. To learn more about Sarah Conway visit SarahConwayProperties.com, email SConway@SarahConwayProperties.com, call (936) 494 – 9999, or visit herhttps://www.facebook.com/pg/SarahConwayProperties/posts/ Facebook page here. www. CHARLIE KRIEGEL Charlie Kriegel’s passion for real estate began when he was working in the insurance industry. 15 years ago, when some friends from his college football days wanted to buy investment properties, Charlie got his license and to his surprise, his business immediately took off. He was recruited to work at one of the area’s premiere brokerages, becoming their youngest agent ever at just 23. Charlie was voted one of Houston’s Top “Up and Coming Realtors®, and is widely recognized as one of Houston’s Premier Real Estate Moguls since he opened his own brokerage three years ago. WinHill Advisors-Kirby is quickly becoming one of the most in-demand brokerages in the state of Texas. They are known for specializing in SFR brokerage services for the Institutional and Individual investor. The company now has 50+ agents and Charlie currently leads his own teams, which did over $75 million in sales last year, making them one of the most successful teams working in the Houston area. For the past six years, Charlie has been honored as the top luxury marketing agent in Houston. Harkening back to his start, Charlie primarily focuses on working with investors including some of the largest hedge funds in the country, focusing on ‘buy/hold’ and ‘buy/flip’ properties. But Charlie still enjoys working with first-time buyers as well, always maintaining the highest standards of excellence, integrity, and commitment no matter who he is working for. He credits WinHill Advisors-Kirby’s diversity in the marketplace as being instrumental to their success. To learn more about Charlie Kriegel and Winhill Advisors Real Estate, call 713.574.3141, email charlie@winhilladvisorskirby.com, or visit winhilladvisors.com or tricities.homesellingnow.com www. While it’s important to point out when an employee is doing something wrong, it is equally – if not more – important to acknowledge when that employee is doing something right. doesn’t is something you should be aware of. Groom from within, and your employees will be grateful and work harder. To learn more about Julie Sanders visit SETXproperties.com, email julie@setxproperties.com, call (409) 729 -SETX ext. 2, or visit her Facebook page here. https://www.facebook.com/setxproperties www.